they would be getting themselves into. What might their six-year odyssey teach others about leadership on community challenges? Barely a blink, but that’s how long it took to set a group of influential residents of Beloit on a path they hoped would alter their city’s future. In 2010, an advertisement was circulating for a national nonprofit that worked to combat obesity. Children in the video mused about what they might do with five extra years of life. (“Go looking for dark matter.” “Sing in front of millions of people.” “Get more hamsters.”) Then came the kicker: Contemporary children were expected to live five years fewer than their parents. “It smacked us, and we said, ‘No way. That’s not happening here,’” says Stephanie Simmons, who had recently been hired as the Mitchell County Regional Medical Foundation’s executive director. She and her cohort had good reason to act. They suspected that their 3,800-person, ag-centric hamlet, located an hour northwest of Salina, mirrored national statistics, with increasing consumption of processed foods and decreasing physical activity. A 2012 study confirmed their suspicions. A third of public school children in the Mitchell County seat were overweight, with 20 percent obese. Those results “hit us really hard,” Simmons says. 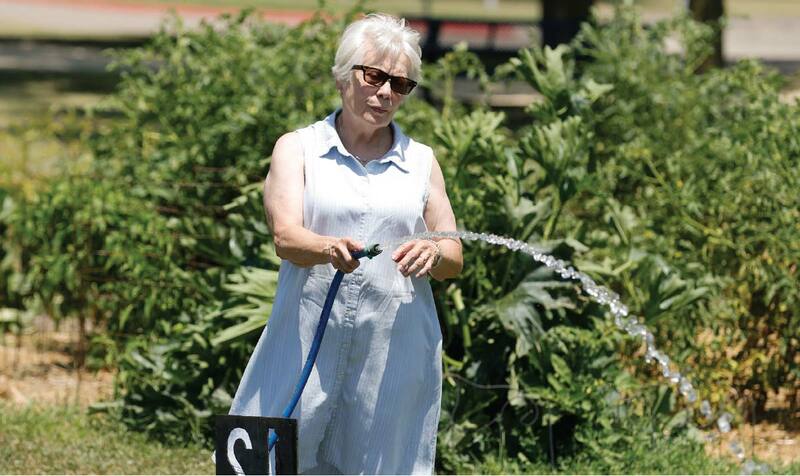 “We’re the crazed health nuts of the community,” says member Cheryl Renter, a former Beloit city councilwoman with a long record of civic involvement. The group’s interest in pushing for changes came at an opportune time. Their community had already begun to lay a foundation for better health. Momentum started four years before the formation of AWARE, in 2006, when the local hospital, technical college and the city worked together to open a wellness center, a $1 million project that included an indoor pool, track, racquetball courts, gymnasium and exercise equipment. Then in 2010, Beloit completed an $11 million renovation of its 25-bed hospital. The hospital formed the Mitchell County Regional Medical Foundation to manage $1.3 million of the total that was raised through donations. As the foundation’s executive director, Simmons led that effort. Around the same time AWARE was ramping up its efforts, Beloit voters also authorized a 0.3 percent sales tax to pay for a $3.9 million waterpark, complete with slides, lazy river and lap pool. “It’s a visionary community,” Simmons says. And one motivated to improve its residents’ health. But health, AWARE members understood, did not equate to just a gym or a pool. They needed to find a way to encourage people to live active lives. As members of the group searched for a concrete goal around which the community could rally, they noticed a problem: None of its recreational assets was easy to reach on foot or by bike. The pool lies on the south edge of town in Chautauqua Park, a 26-acre green space that’s home to campgrounds and an annual drive-through Christmas-lights display. But the sidewalk leading from downtown ends in a rock-filled parking lot, before the grain elevator with its truck traffic, before the six sets of railroad tracks, before the highway bridge over the Solomon River. On the opposite end of town, the wellness center faces a similar limitation: It borders U.S. Highway 24, with no pedestrian crossings or sidewalks in sight. In the middle lies the community’s heart: The Beloit Junior/Senior High School football field, which sits a block and two right-angle turns down the street from the parking lot. On game nights in the fall, cars cram the adjacent streets. People have to dodge traffic to reach the field, Simmons says. The elementary school lacks sidewalks in some areas as well. The group wanted to connect all the community’s activity centers with a trail, so it applied for a Kansas Health Foundation Healthy Communities Initiative grant. The application started a typical hurry-up-and-wait process, but AWARE didn’t want to lose momentum. Members, who included the wellness-center director and the county health department administrator, spent the months waiting for the grant announcement by applying for six more grants. Stephanie Simmons and Greg Renter, here walking a trail near Beloit’s community garden, had no clue what they were getting into when they joined a small group pushing to make their community a healthier place to live. By the end of 2011, good news poured in. The Kansas Health Foundation awarded the group $25,000 to plan for community wide, health-focused changes, of which a one-mile pedestrian and bike trail was the first priority. Member Mandy Fincham applied for and got a $15,000 Sunflower Foundation grant (leading to $15,000 more in donations) to fund the trail, which opened the next year, 2012. About the same time, they got another $75,000 grant from the KHF, to be paid over three years. The KHF grant was worth celebrating, but it had a caveat: AWARE would have to influence policy, not just build a trail. The foundation’s perspective was that changing policy would provide long-term benefits to the community’s health. But it wasn’t what AWARE was used to focusing on. “This is a highly functioning, competent group of people being told essentially that the way they do their work – it’s good, but it’s not going to make long-term change,” says Kevin Bomhoff, director of strategic development at Wichita State University’s Community Engagement Institute and a Kansas Leadership Center faculty member who advised Simmons and the AWARE team. 2. What adaptive challenges do you see emerging? Getting to the community’s football field from the junior-senior high school isn’t always easy, as Caden Emmot demonstrates. On game nights, cars cram the adjacent streets and people have to dodge traffic to reach the field. “It took our lightbulbs a while to come on,” says Greg Renter, a retired superintendent and member of AWARE who is married to Cheryl Renter. The goal of improving overall health was daunting and vague. It would take time to define and prioritize sustainable, written goals, but the group knew one thing: “We wanted to be highly aggressive in our impact,” Simmons says. In leadership parlance, theirs is a “hold to purpose” story, one in which advocates must tweak approaches to achieve objectives without losing sight of their big-picture goal. So the core leadership team of AWARE adjusted. They recognized that partnerships would be key to making progress. They attended city meetings and found opportunities to connect with leaders in the community who might support their cause. Because it relied on grant money and donations, the trail would not tap local tax coffers, so representatives from the city and county government expressed tentative support. Simmons organized “lunch and learn” meetings about AWARE’s goals for policymakers. “They began to really build these relationships one by one with all kinds of people that were really critical stakeholders organizationally,” Bomhoff says. Gradually, members of AWARE connected the dots of possibility regarding the health of the community. They also realized they needed to engage residents. In other words, residents wanted good sidewalks. Sidewalks, where they existed in Beloit, were inconsistent. Many were made of concrete or historic post-rock slabs. They ranged in width from 3 to 6 feet. And many had been squeezed out of place by roots. About two-thirds of the health survey respondents said the condition of the city’s sidewalks hindered physical activity. “If a person has a safe route to get to their destination, they are more likely to leave the car parked,” Greg Renter told The Beloit Call, the community’s thrice-a-week newspaper. AWARE mobilized. The group recruited 60 high schoolers, divided into teams of three, to walk every inch of Beloit – especially routes that students might use to walk or bike to school. Each team was to map, measure and photograph every crack of every sidewalk. The volunteers found that about half of Beloit’s streets lacked sidewalks. City officials acknowledged that sidewalk policy hadn’t been updated since the 1950s. AWARE got to work at an ideal time to influence policy. In 2013, the city of Beloit began to overhaul its comprehensive plan, a document that would guide policy for growth and infrastructure investments in the community for 25 years. The plan seemed a natural opportunity to incorporate healthy initiatives, so Simmons, Cheryl Renter and AWARE trail project leader Mandy Fincham took advantage and applied for seats on the 42-person advisory committee. All three were appointed, providing the AWARE team a subtle shift in perspective from outside the sphere of influence to inside. But while the Planning Steering Committee allowed AWARE members to help shape the health initiatives included in the comprehensive plan, they would also have to consider the plan as a whole. “Man, did we go for a ride we never expected,” Simmons says. Residents quickly became skeptical and mistrustful when Beloit hired an out-of-state consultant, Hanna:Keelan Associates of Lincoln, Nebraska, to work on the plan. “What started out bright and positive got very muddled,” Simmons says. Meetings of the Planning Steering Committee felt clipped and quick, Simmons says. Most of the discussion happened in closed-door work sessions that came to be viewed by some members of the community as a black hole of information, she says. In June 2014, Hanna:Keelan conducted an informational open house. It displayed a map that drew a three-mile zone around the city limits to show the region that Kansas law would allow the city to establish an “extra-territorial planning jurisdiction,” a zoning tool to control development. That detail proved a flash point for opposition. “People don’t always jump to conclusions – they leap,” Cheryl Renter says. 1. How have the challenges facing AWARE evolved? Are they becoming more technical or more adaptive? 2. How would you respond if you were in their shoes? 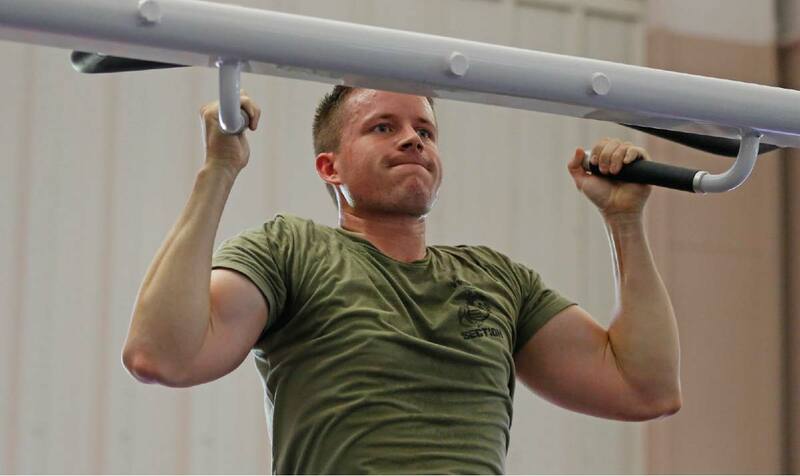 Matt Kuiack, a Mitchell County sheriff’s deputy, works out in Beloit’s rec center, one of the places the community group identified as needing more pedestrian connectivity. For some officials, the three-mile zone was simply a good way for the community to ensure that growth proceeded smoothly. Hanna:Keelan representative Lonnie Dickson told The Beloit Call that such planning jurisdictions were common among cities. But county residents feared the zone was tantamount to annexation. Some imagined they could no longer shoot targets in the backyard or that they would have to rewire their homes to meet city code, Cheryl Renter says. Their claims gained heft when the area’s second-largest employer, Agco Corp., came out in opposition to the zone. The implement manufacturer sits just outside the city limits and employed nearly 400 workers at the time. comprehensive plan before recommending it to the City Council. Commission Chairman Jeff Chrisman, a local contractor, resigned after a “loss of business” related to the zoning discussions, he wrote to the planning commission. One of the most vocal opponents of the three-mile zone was Mitchell County Commissioner Tom Claussen, who lives on unincorporated land outside the three-mile planning jurisdiction. He pushed for the planning commission to follow a state law that required it to include two members from outside the city but inside the buffer to serve on the panel. With Chrisman’s resignation and the recent death of another member, there were two openings. When Mayor Tom Naasz went looking for county residents he turned to Cheryl Renter, known locally for her public service and volunteerism. Naasz asked her to serve, “which in my idiocy I agreed to do,” she says. Fellow new appointee Greg Drum said he opposed the three-mile zone because he had seen a similar arrangement drive business out of town near his former home in California. Renter was named chairwoman at her first meeting, another advantage for AWARE. Kind of. “Things got so convoluted,” Renter says. Convoluted because a three-mile zone had been in place in Beloit, unbeknownst to many opponents, since 1973. But increased awareness of the three-mile zone now meant it faced considerable scrutiny. Even though the buffer had nothing to do with AWARE’s health initiatives, because of the contentiousness that had erupted, the entire plan looked like it might go down in flames. At one packed meeting, Drum asked for any supporters of the three-mile zone to identify themselves. None did. AWARE feared all of its efforts would go for naught. Meanwhile, AWARE members knew that even if the comprehensive plan received approval, it would not be enough on its own to bring the group’s goals to fruition. Their health initiatives still had no budget, and there was no clear means of translating them into actual policy. Mistrust grew when the city didn’t post a copy of the proposed comprehensive plan online until February 2015, eight months after the initial open house and only three days before the planning commission was scheduled to vote. from building homes and businesses. He called for striking the three-mile zone altogether. Cheryl Renter and the three other commission members present voted down the plan, agreeing it needed more discussion and input from the community. A planning process projected to take nine months was dragging on with no end in sight. Digging deeper, planning commission members consulted attorneys from the League of Kansas Municipalities and found quite a few places throughout the comprehensive plan that needed revision to comply with Kansas statutes. Important values for the community were suddenly coming into conflict. On one hand, residents clearly valued health and improving health. However, they also cared very deeply about preserving their rural way of life. Whether they lived inside or outside the city, most of Beloit’s residents identified with rural interests. The prospect that a buffer might lead to regulations that would encroach on the community’s rural lifestyle and its lifeblood proved very troubling. The divided attitudes in the community also split members of AWARE. Several had family members who owned land within the proposed zone – relatives who “would tug at you and say, why is AWARE NCK in favor?” Cheryl Renter says. deeply held community values come into conflict? What kind of leadership is called for? committee dealing with a controversial comprehensive plan. Despite the level of heat being generated by the comprehensive plan in the community, members of AWARE made space to talk through their differences. “We were secure in having those conversations,” Simmons says. Internal strife proved to be the catalyst AWARE members needed to hunker down. Members of this grass-roots group wore their sincerity and commitment literally on their sleeves, in matching, embroidered AWARE polos. Their mutual drive compelled them to stay on task, but “our coalition had to weekly check ourselves,” Simmons wrote in a summary of AWARE’s accomplishments. They decided to regroup with a retreat at the Renters’ home inside the three-mile zone. This allowed them to drill down to the raw, vulnerable emotion behind their drive for better health in their hometown. The retreat, which became an annual event, unleashed “a lot of tears and pain that symbolically let us let go of (the frustrations),” Simmons says. 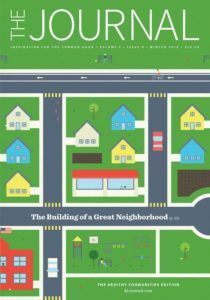 AWARE came away focused on the idea that the city’s comprehensive plan was their best shot to influence policy and win the grant money they needed to build a healthier community. Rather than let others drive the conversation, AWARE members decided to launch their own low-key marketing campaign. The zoning controversy had drowned out any good news about progress on the health front. Simmons says members agreed it was best not to yell into the cacophony of the zoning debate and attempt to be “the sole runner” of the health initiatives. After all, there was a chance the comprehensive plan controversy might eventually blow over, and the group didn’t want to get caught up in hot-button debates about the issue of sustainability or the role of government. “We got skillful with how we talked to policymakers and why it was important,” Simmons says. AWARE members told people that they understood their concerns about the buffer and the way it was introduced, but that the plan included the pedestrian and trail connections that 82 percent of survey respondents had identified as being “greatly” or “somewhat” needed in a city-sponsored survey. The plan would require sidewalks for all new developments, plus bike lanes and pedestrian routes that would encourage children to walk or bike to school. The message worked. Even with reservations about the three-mile zone that he had expressed before the May 2015 vote, Greg Drum voted to recommend to the City Council a version of the comprehensive plan that included nuanced language specifying that the three-mile buffer would have to be zoned in separate, future action by the planning commission. A flood of relief rippled through chairwoman Cheryl Renter and the rest of AWARE as the plan passed the planning commission, 4-1. Next stop for the comprehensive plan was the City Council. At a June 2015 meeting, zoning dominated the discussion for an hour. Mayor Tom Naasz said he thought its passage would inspire farmers to stop patronizing the seed and ag service business he managed. AWARE’s message broke through, however. Drum, who was not affiliated with AWARE, told the council he favored the plan despite its flaws because it would qualify the city for grants. But the plan failed 4-3. A year after the comprehensive plan’s introduction to the public, back to the planning commission it went – a frustrating development for Chairwoman and AWARE member Cheryl Renter. “Now we’re just locked,” she says. In the procedural morass, there was a positive takeaway. AWARE had the names of dissenting councilmen to lobby. Each dissenter stated at a July 7, 2015, council meeting that the plan was good, except for the three-mile zone. They wanted either to strike it completely or reduce it to a maximum of two miles. AWARE’s core team pressed forward under the assumption that they would succeed working through the comprehensive plan. That same meeting, Simmons sat in the audience, representing AWARE with a constant but gentle presence. She waited until discussion of the comprehensive plan concluded and stood up to ask the council to endorse a Kansas Department of Transportation proposal for bike lane signs. The comprehensive plan cleared its final hurdle at a July 2015 council meeting. One of the original dissenting council members, Rick Brown, first moved to accept the plan with no zone outside the city limits. That failed. Then a compromise of a two-mile zone was enough to sway one of the dissenters, Councilman Bob Petterson, and propel the plan to approval on a 4-3 vote. “I was looking to get this thing settled and get it off the danged agenda so people could get back together and keep from splitting everybody up,” Petterson says. Because of AWARE’s work behind the scenes, health initiatives such as safer routes to school, updated green spaces, improved sidewalks and trails advanced a step closer to fruition, embedded in the 134-page plan. to ensure their plans were implemented. 1. Whose leadership skills do you think played the biggest part in the outcome with the comprehensive plan? What leadership competencies do you see reflected in this story? 2. How might implementation represent a different kind of leadership challenge for AWARE than getting the plan passed? a winding path before being set in motion in September 2016. In the meantime, Simmons and the AWARE team busied themselves with developing bicycle and pedestrian projects that the healthy living group could examine. HEAL met for its first meeting in Spring 2017. Within 30 days of its creation, the group’s members began work sessions to discuss the master plan. HEAL’s proposals to the city council features uniform, updated sidewalks, and bike and recreation trails – including a paved path along the Solomon River that would connect the downtown area with the outdoor pool. The Pedestrian and Bicycle Improvements Master Plan approved last November could take 20 years or more to implement. It’ll be a busy couple of decades, if the first project is any indication. Bids went out in Summer 2017 for a slate of sidewalk improvements on two arterial routes that link to both the public and private elementary schools. 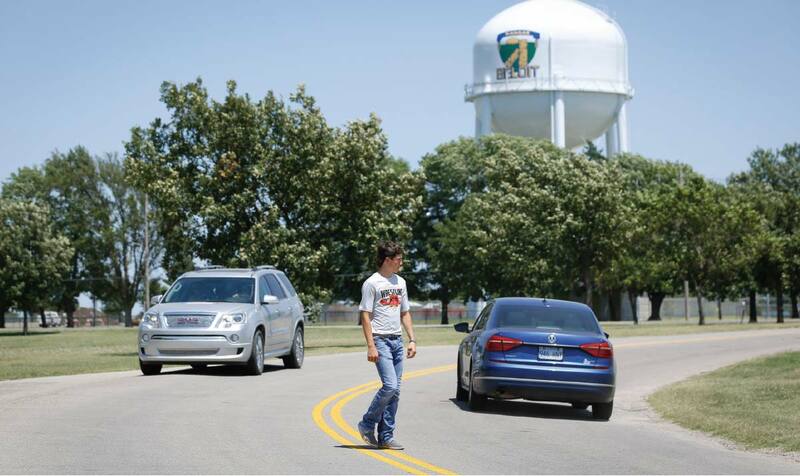 That project will use $250,000 that AWARE won from the Kansas Department of Transportation and Federal Highway Administration for the Safe Routes to School Program. community change and are rejuvenated to continue,” Simmons wrote in her AWARE summary. Among those lessons: the importance of holding to purpose, the idea that progress takes time and adaptive work is ongoing, and that partnerships and networks of allies are required. Indeed, AWARE members are just getting started. They will hold themselves and the city-sponsored HEAL Council accountable with annual reviews of progress related to Beloit’s comprehensive plan. They’ll mobilize with action plans based on feedback from city and county policymakers. And their emerging regional work to foster the growth and distribution ofhealthy foods might be a story in itself. Finding ways to connect all of the community’s activity centers with a trail was a core goal of AWARE NCK. 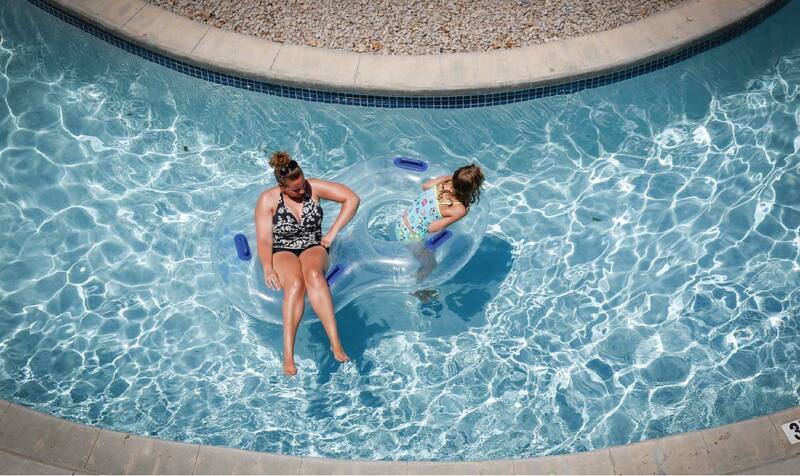 The group hoped to make it easier for residents, including Melanie Bourbon and her daughter Allie, to use amenities like the lazy river at the swimming pool. But its pursuit of grants to construct the trail led the group down the path of influencing community policy. This article was originally published in the Winter 2018 issue of The Journal, a publication of the Kansas Leadership Center. To learn more about KLC, visit http://kansasleadershipcenter.org. For a subscription to the printed edition of The Journal, visit klcjr.nl/amzsubscribe. This entry was posted in Leadership, Policy. Bookmark the permalink.